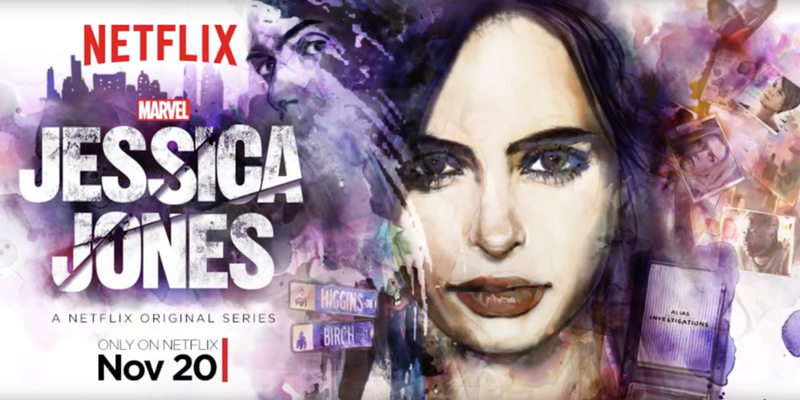 So, a week so so back I was invited to guest on the School of Movies podcast to talk about the recently released Marvel TV show Jessica Jones. We ended up doing a mega long three hour spoilercast for the whole first season. The spoilercast was an absolute blast to take part in, you can check it out here! Was a bit disappointed no one discussed the shows negatives during the 3 hours! e.g. the lazy writing where no one thinks of using earplugs to completely defeat Killgrave (if you can’t hear his commands, he can’t possibly control you). The weird thing is Trish does try this more or less in the last episode… by playing super loud music, but her headphones are knocked off during the fight. Why does no one think of this sooner??? Also you guy’s theory that Killgrave can only influence actions that are part of the person’s character is kinda blown apart with Killgrave instructing Trish to kill herself with a gun. Suicidal tendency is NOT something I associate with Trish’s character!